We had a blast doing this party because it shied away from the usual color tones of a girl’s birthday party. 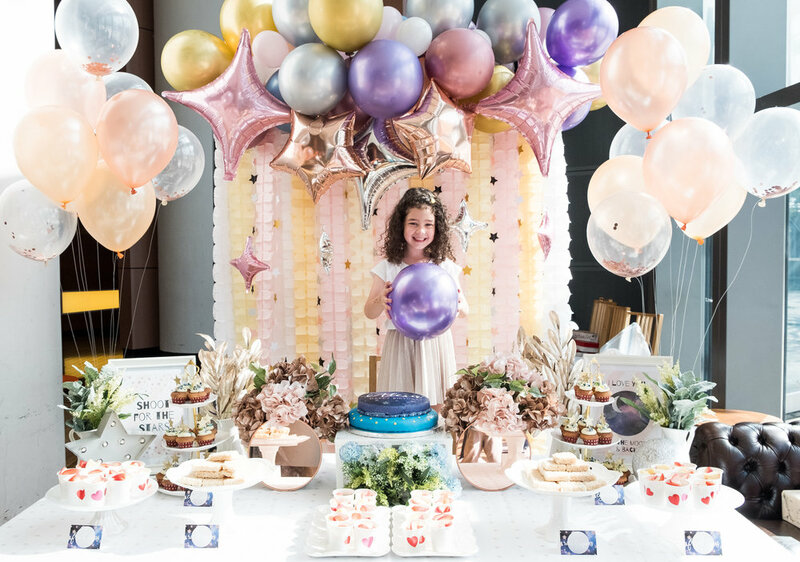 We created a wonderful color palette for Alexa’s party based on what she wanted - mainly blues, rose gold, metallic pink, and silver tones with hints of black, champagne gold, peach, purple, white, and pale yellow. To highlight the birthday cake, desserts and treats made by Alexa’s mom, we arranged beautiful rose gold / gold branches and hydrangeas that mixed with some greens on the table. We accented these with rose gold trimmed round mirrors to add a little depth. We also made this authentic looking silver moon and brought in a gray star lamp to create a more whimsical feel. 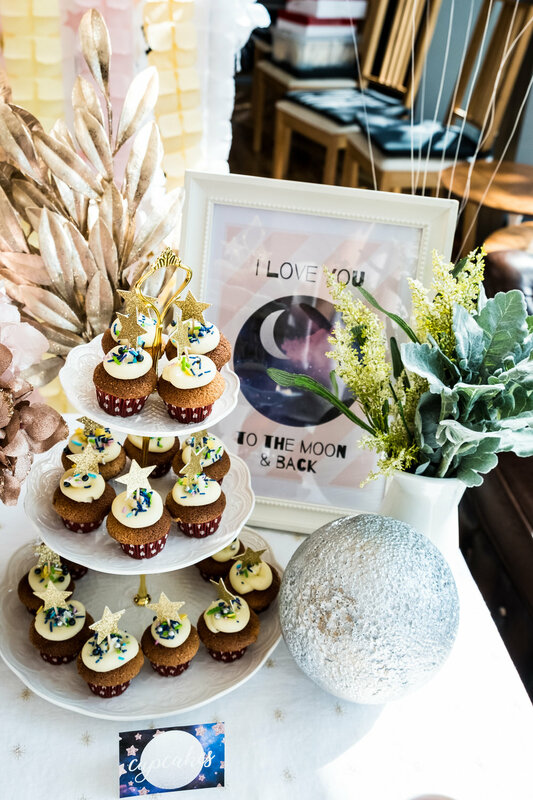 We used this beautiful white tablecloth that had little gold woven stars all over it - very subtle but gave it so much character (just the way we like it). 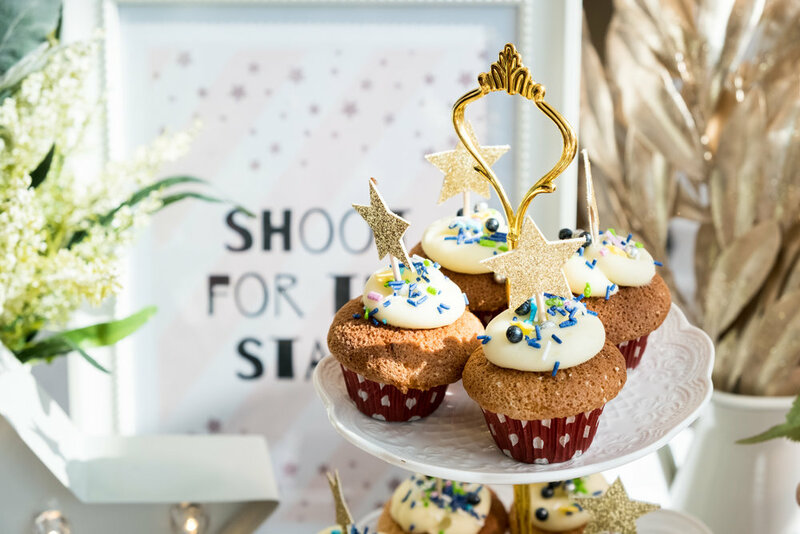 Added our servingware, golden cupcake star toppers and some blue and green flowers to complement the birthday cake, we got ourselves one interesting table. The backdrop was something we were excited about. We used clover leaf streamers as a background for these pretty little star garlands in pink, black, silver, and gold. 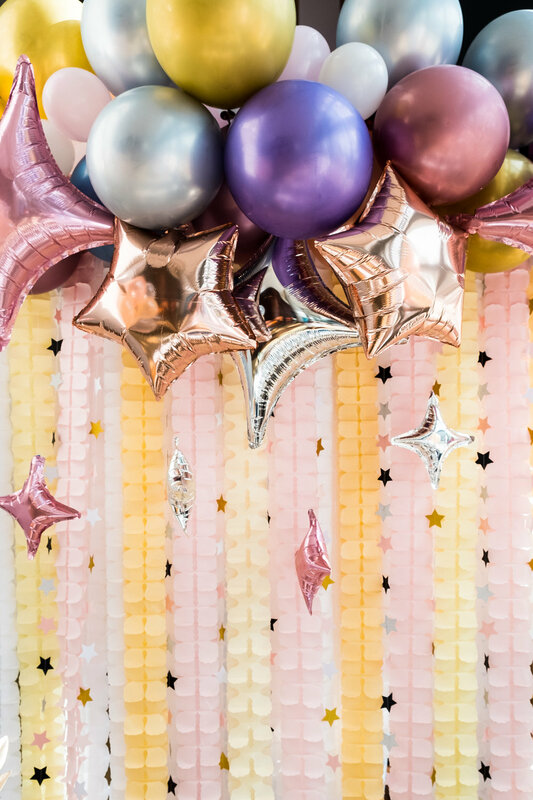 Then we added a beautiful metallic balloon garland that we accented with a variety of metallic star balloons. Don’t those little pink star balloons look adorable? Flanking the table, we had these two pastel peach rose and clear balloons to tone the dark colors done. Alexa’s mom also us to prepare two activities for the kids - we had cookie decorating, slime activity, and a scavenger hunt. For the cookie decorating, we had star and crescent moon cookies that came with three bags of colored icing and sprinkles. The kids had a great time doing this that most of them didn’t let the cookies dry and just ate them right away. For the slime, we took it outside and kids and parents had all kinds of messy fun. We prepared chocolate moon rocks in little labelled packets that we hid throughout the area.